There’s a great little article at SmartTutor by Laura Ketcham titled Cell Phones in the Learning Environment: Missed Opportunity? I like her list for incorporating cell phones into lessons because it’s simple and basic–something that any student or teacher could do in any class. Becoming comfortable in using cellphones as learning tools is the first step in harnessing the power for more advanced functions and activities. I’ve organized her list into categories. Give them a try today! ORGANIZATION: Students use the calendar option of their cell phone to add in assessment dates, homework, and other needed notes for assignments. FEEDBACK: Cellphone texting can be used as a response system. http://www.PollEverywhere.com allows kids to text in their responses to a question and you can immediately gauge understanding and re-teach a topic if needed. CALCULATION: The calculator function of a cell phone can be used for solving math problems. CONTENT: Educational videos and podcasts can be infused into your lessons and kids can load and listen to them on their cell phones. TIMING: Children can use the clock functions for a stopwatch, timer, or to access times around the world. ARCHIVING & CURATION: With photo and video capture capabilities, they can archive class lectures, material from the board, or for creative assignments. ACCESS REFERENCES: If available, they can use educational apps (applications) like dictionaries, calculators, flashcard creators, Google Earth, read public domain books, view the Constitution, use periodic tables, and access scientific calculators. RESEARCH: An Internet search can be performed for basic research or fact finding when classroom computers may be unavailable. DEMONSTRATIONS OF LEARNING: Students can use their cellphones to leave audio comments on VoiceThread, an online Web 2.0 application where students create photo slideshows with comments. 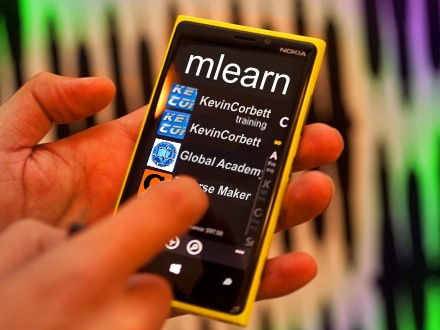 Many Web 2.0 sites are becoming more mobile learning friendly.